Some people prefer to have their wifi turned off at night. DD-wrt already provides out of the box reprogrammability of the WPS button so you can use that button to turn the wifi off/on. I’m no network expert so I checked the MAC address of the wifi interface in the web admin Status > Wireless page ( http://192.168.1.1/Status_Wireless.asp ) and figured eth1 must be the wifi interface. And indeed, using the following command it worked! You can check whether radio state changes in the wireless status page mentioned above. For automation, put these commands in a cron job on the Administration > Management page ( http://192.168.1.1/Management.asp ). In Belgium you can use your EID to login onto the federal portal for using electronic services, for example, for filing tax return. Installation instructions are provided for Windows, Mac and (Ubuntu) Linux. This is what I had to do to get it working on opensuse 12.1 on a Dell Precision M4600. Since the M4600 is a fairly new model, I had to upgrade my pcsc/ccid package to the latest version. It seems the M4600 comes with a Broadcom Corp 5880 smartcard reader which is connected through USB (internally). and “switch system packages” in Yast. You should have installed at least the following packages: pcsc-lite, libpcsclite1 and libpth20. 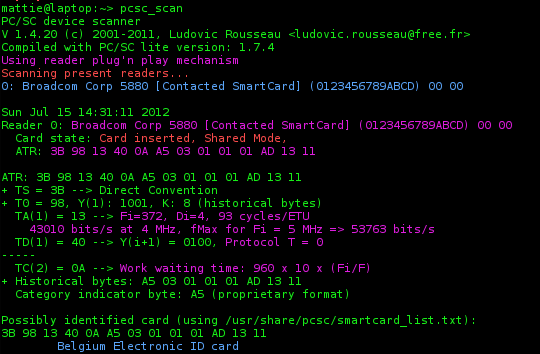 Depending on your smartcard reader, you need a different pcsc plugin package. The Broadcom 5880 smartcard reader is supported through the ccid driver. This means we have to install the pcsc-ccid package from the chipcard repo. and install the eid-mw package. I also noticed the eid-mw-firefox package in this repo, but it did not seem to work in my case, possibly because I’m using 64-bit firefox. Install the belgium eid firefox add-on. I’m not sure whether the firefox add-on is really needed. Afterwards I uninstalled it and it kept working. google the device or check the device compatibility lists of the pcsc-<driver> packages. You can find the ccid device list here. be sure to be using all the packages from the chipcard repo by using the “switch system packages”. firmware upgrade as suggested here, was not necessary. Read the whole thread to find out why a ccid upgrade was actually necessary. You can obtain it from this page under the catory “other”. Although I installed this add-on, I don’t believe it is needed. I did have trouble the first time I signed in: it succeeded, but redirected me to a page where I would again need to choose whether I wanted to sign on with EID or password. I closed firefox, and tried again, this time it just worked. You can surf to this test page to test whether everything is configured correctly. I have Dirt 2 installed on a partition with 15 GB free space, but that doesn’t matter. It requires 2GB to save a replay! I does not inform the player when it gets turned off (it used to work in the beginning). There is no visual indication whatsoever, that the replay functionality uberhaupt exists but is disabled! It is surgically removed from the gui instead of just a disabled button, for example.